Dublin, Glendalough, Belfast, Giant's Causeway, Derry, Sligo, Mayo, Greenway, Lough Corrib, Mohr, Limerick, Killarney, Ring of Kerry, Dunloe, Glengarrif, Cork, Kilkenny, and more! Sophisticated Dublin teems with vibrant energy and modern neighborhoods blend with historic buildings and majestic cathedrals. All around are hidden delights waiting to be experienced, captivating us with their beauty and charm. This Brand g tour is designed to make the most of Ireland. 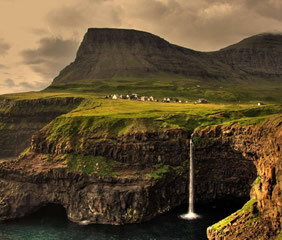 This 12 day gay group tour of Ireland brings you on a journey of discovery and will highlight the sights which are renowned, but also we go off the beaten track with adventures that take you from Dublin to Belfast, over to the North West coast and the Wild Atlantic Way and back through parts of Ireland’s Ancient East. Walk on the historic Walls of Derry, enjoy a pint of Guinness in the Store house visitor centre or have a night of fun in a whiskey distillery, have a lunch at the spot in Sligo where the world’s first take way was over 4000 years ago! Mix with the local characters which makes this journey one of the special insights into the hidden and best Ireland offers its guests. Welcome to Dublin! You will be met at the airport and transferred to the Dylan Hotel. Our adventure begins with a festive welcome lunch in Nancy Hands authentic Irish pub and restaurant, including a flaming Irish Coffee demonstration. Continue with an afternoon walking tour of the city. Experience the 2,000-year-old capital city by exploring some of its beautiful architecture, ancient city walls, and backstreets alive with history, heritage and culture with a local expert. Today’s tour includes a whiskey tasting at the Old Jameson Distillery and tonight’s welcome dinner will be at the Dylan Hotel. This morning, visit Ballyknocken Farm and Cookery School, home to celebrity chef Catherine (Byrne) Fulvio. Here, you’ll have the opportunity to prepare your own lunch in a hands on cookery class, using one key ingredient, Guinness. This afternoon, we head to the monastic ruins of Glendalough. Established by St. Kevin in the 6th Century, its ruined churches are scattered around two lakes. One of Europe’s finest examples of Round Tower architecture can be found here, as well as a Cathedral, stone churches and decorated crosses. Return to Dublin for a dinner together at Peploes restaurant. 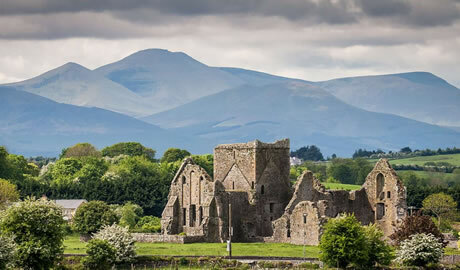 Travel to the Boyne Valley in County Meath. This river valley was the cradle of Irish civilization and supported a sophisticated society in Neolithic times. Take in the sights at Mellifont Abbey, the ruins of the old Cistercian abbey date back to 1142, when the first Cistercians were invited to Ireland by St. Malachy, the archbishop of Armagh. The newer abbey building is still in use by the Cistercian community of monks today. You will also visit the Hill of Tara, the ancient seat of the Celtic High Kings of Ireland. The ring patterns left on the hill are all that remains of the great fort of kings. Then on to Trim Castle, a Norman castle built for the first Lord Viceroy to Ireland, Hugh de Lacy. Although it is probably more famous now for being the filming location of the Mel Gibson film, Braveheart. On arrival in Belfast, enjoy a Black Taxi Tour of the city, Shankill and Falls Road learning of how things where during the course of the Troubles. See the wall murals that are known all over the world. Every mural tells a story which will be explained in great detail. Then we will take you to the famous peace wall that separates both Protestant and Catholic communities. Where you will get a chance to sign your name on the wall. Tonight we enjoy dinner together at Deanes Meat Locker, before settling into the Merchant Hotel for a relaxing night. Our first stop today is at the Carrick-a-Rede Rope Bridge, which is suspended almost 100 ft (30 m) above sea level, and was first erected by salmon fishermen 350 years ago. Today it is a popular attraction for thrill-seekers and birdwatchers. If you are bold enough to cross the 65 ft (20 m) bridge, stretching from the mainland to ‘Rocky Island’, you will be rewarded with fantastic views of Rathlin Island, Scotland and the Causeway Coast. Get a bird’s eye view of the clear, green water flowing around the ancient caves and caverns far below – if you dare to look down. 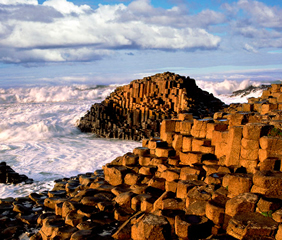 Next we explore the unique Giant’s Causeway Flanked by the wild North Atlantic Ocean on one side and a landscape of dramatic cliffs on the other, for centuries the Giant’s Causeway has inspired artists, stirred scientific debate and captured the imagination of all who see it. Experience the famous basalt columns with our knowledgeable guide. Climb the Shepherd’s Steps and take a hike along the cliff-top trail for bird’s eye views of the causeway coastline – famed world-wide for its beauty. Next, we stop in the pretty town of Bushmills where you will enjoy lunch at Bushmills Inn. We continue to the walled city of Derry where you can have dinner at your leisure tonight before settling into a restful sleep at the Shipquay Boutique Hotel. Drumcliffe, County Sligo is set against the striking backdrop of the Benbulben Mountains. It is best known as the final resting place of W.B. Yeats. Found in the churchyard, his grave is marked with a simple headstone with the inscription, “cast a cold eye on life, on death, horseman, pass by.” This was Yeats’ self penned epitaph together with the instructions that the grave consist of “no marble, no conventional phrase”. The graveyard also contains a high cross and nearby is the site of a 6th Century Columbian monastery. Continue to majestic Ashford Castle, the jewel in the crown of Ireland’s most iconic hotels. The estate is set on 350 acres, including the picturesque shores of Lough Corrib. Dating back to 1228, the castle now enters a new chapter in its history, as part of the prestigious Red Carnation Hotel Collection . Hear about the illustrious history of the castle and about the Castle’s recent refurbishment, with guest rooms and public areas restored precisely to their former glory. Tonight we enjoy dinner together at Cullen’s in Ashford Castle. Jackets and ties are required for gentlemen after 7pm. Today we escape the bustle of urban life on the 42km Great Western Greenway, the longest off- road walking and cycling trail in Ireland. The World Class Great Western Greenway is a traffic free cycling and walking trail which follows the route of the renowned Westport to Achill railway. Following lunch we have a two hour cruise of the Lough Corrib, to explore the beautiful lake shore, with a guided stop over on the Isle of Innisfree. This evening, dine like royalty in Ashford Castle’s George V Restaurant. Jackets and ties are required for gentlemen after 7pm. 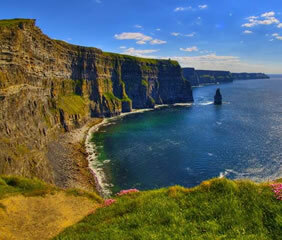 Today’s highlight is a visit to the Cliffs of Moher in County Clare, which are Ireland’s most visited natural attraction with a magical vista that captures the hearts of one million visitors every year and are a Signature Discovery Point in the heart of the Wild Atlantic Way. They stretch for 8km (5miles), as the crow flies, along the Atlantic coast of County Clare in the west of Ireland and reach 214m (702 feet) at their highest point at Knockardakin just north of O’Brien’s Tower. Here you can have a world class one in a million visitor experience. 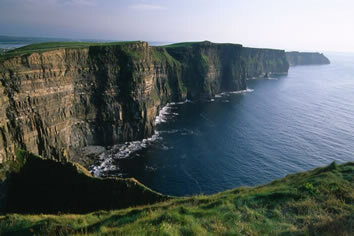 Next, the Burren is an area of karst landscape on in County Clare. The word “Burren” comes from an Irish word “Boíreann” meaning a rocky place. This is an extremely appropriate name when you consider the lack of soil cover and the extent of exposed Limestone Pavement. However it has been referred to in the past as “Fertile rock” due to the mixture of nutrient rich herb and floral species. Tonight we check into the boutique Ross hotel and you have the opportunity to enjoy dinner at your leisure. 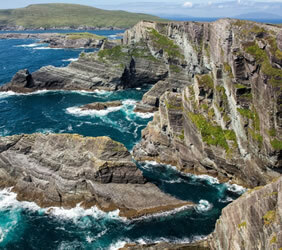 Today enjoy a full day Ring of Kerry Tour. Travel the road that winds around the beautiful Iveragh Peninsula, better known as “The Ring of Kerry.” It is undoubtedly one of the most magical places in all Ireland. Perhaps choose and optional excursion to meet a local specialist for a half day of hiking. Enjoy a beautiful walk out of Killarney to follow an old “Butter Road” and climb Torc Mountain and soak in the incredible views. Return to Killarney and this evening enjoy a dinner in the Ross Hotel at Cellar One. The Gap of Dunloe is a narrow pass between Macgillycuddy’s Reeks and the Purple Mountains near Killarney. It begins at Kate Kearney’s Cottage and ends with a descent into The Black Valley, a distance of approximately 11 km (7 miles). As one travels through the Gap from Kate Kearney’s, five small lakes are passed: Coosaun Lough, Black Lake, Cushnavally Lake, Auger Lake, and Black Lough; in turn, these lakes are connected by the River Loe from which the gap gets its name. Between the first two lakes is an old arch bridge called the ‘Wishing Bridge’ so named because it is said that wishes made while upon it are destined to come true. This is more of an adventure than tour. Combination of a bus to Kate Kearney’s Cottage, then a journey of 7 miles/11.2 km ahead of you to be taken by jaunting car through the famous gap, a glaciated valley to Lord Brandon’s Cottage, where a barbecue lunch will be prepared for us. Tonight enjoy dinner and entertainment in Jarvey's Rest. 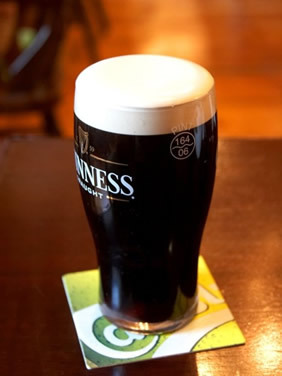 Jarvey's Rest is an award winning Irish Pub and the perfect venue for a genuine Irish pub experience with gastro pub style food, a choice of Irish drinks and live entertainment. This famous Irish pub still contains original wooden floors, stonewalls, beamed ceilings and open fires. Overnight at the Ross Hotel. Today’s touring includes Garnish Island, located in the sheltered harbor of Glengarriff, in Southwest Ireland. Garnish is world renowned for its beautiful gardens known to horticulturists and lovers of trees and shrubs all around the world. Following the visit to Garnish Island, we will have a traditional pub lunch en route to Cork. The evening and dinner is at your leisure. Overnight at the River Lee Hotel. After a hearty breakfast, we travel to the medieval city Kilkenny, Kilkenny’s rich medieval heritage is evident in the city’s treasure trove of historical buildings and landmarks, exemplified by the magnificent Kilkenny Castle. Kilkenny is arguably the pre-eminent medieval city in Ireland, with the current layout of the city clearly grounded in the city’s medieval roots. However, the city’s origins predate the medieval landmarks existing today. Saint Canice founded a monastic settlement in Kilkenny in the sixth century, unfortunately the sole remaining landmark from this settlement is the round tower positioned alongside the cathedral. Strongbow, the legendary Norman invader, built a fort in the twelfth century on the site where Kilkenny Castle stands today. Subsequent to this event, William Marshall (Strongbow’s son-in-law and Earl of Pembroke) oversaw the building and maintenance of fortified city walls thus consolidating the Norman’s position of power in the city. However, it wasn’t until the seventeenth century that Kilkenny really entered its golden age. The parliament known as the Confederation of Kilkenny was founded in 1641. One of the parliament’s main objectives was to unite resistance against English persecution of Irish Catholics. With the emergence of this parliament, Kilkenny entered a period of unparalleled success. Over time, however, the influence of the Confederation of Kilkenny diminished. Oliver Cromwell’s arrival in Kilkenny heralded the dissolution of the parliament, and the city never quite regained the prosperity it had previously been celebrated for. Following lunch, we will head back to Dublin for free time or a visit to the Guinness Storehouse. A farewell dinner is planned tonight at the legendary Beef and Lobster. Overnight at the Dylan Hotel. They say all good things come to an end, and this morning your wonderful Ireland experience comes to an end. After another delicious breakfast you will be taken to Dublin Airport for your onward journey, or return home. As you wait for your flight, sit back and relive the magical memories of your trip to the Emerald Isle. On an exclusive Victorian street, the Dylan Hotel is nestled in the heart of Dublin city center’s most sophisticated quarter. This 5 star boutique city center hotel is located 10 minutes walk from Grafton Street, St. Stephen’s Green, the Aviva Stadium and the RDS and is in the epicenter of Dublin’s happening cultural scene. The hotel is a destination for the endless array of Dublin City fashion, leisure and business. The luxury boutique hotel is steps away from the chicest Dublin restaurants, shopping and night life and houses the award winning Dylan Restaurant. Stunning, chic decor and spacious rooms with Italian marble bathrooms are offered at this 5-star boutique hotel. With Bose iPod docking stations loaded with historic Dublin walking tours, and luxurious beds and linen, each beautiful room provides a plasma-screen TV. Guests can enjoy an in-room movie menu, free Wi-Fi, and complimentary mineral water. The Dylan restaurant serves gourmet Bistro-style cuisine using the finest of Irish ingredients. The Dylan Bar overlooks the restaurant and has a fine selection of cocktails, wines and an outside terrace area. Room service is also available. The AA 5 Red Star Merchant Hotel in Belfast is situated in the heart of Belfast city center’s historic Cathedral Quarter. The grandeur of the original Grade A listed building is complemented by an elegant Art Deco inspired wing with a multitude of exciting amenities. This striking Belfast Hotel includes a stunning luxury spa, a rooftop gymnasium with panoramic city views, a dedicated meeting and events suite and a fabulous jazz bar. The Merchant Hotel Belfast is located a short distance from a host of Belfast Attractions including Victoria Square shopping center, the Ulster Museum, the Titanic Quarter and The Waterfront Hall. All of the elegantly appointed rooms are decorated with original artwork. They each have black-out blinds, a flat-screen TV, and spacious en suite marble bathrooms. Shipquay Boutique Hotel offers accommodation in Derry. The property neighbours Richmond Shopping Centre and is 280 m from Foyleside Shopping Centre. It has views of the Derry City Walls. Guests can enjoy the on-site restaurant and bar. Free WiFi is available throughout the property. Shipquay Boutique Hotel features a restaurant and wine bar, as well as the separate 'Lock & Quay' downstairs bar, which offers a cocktail menu. There is a 24-hour front desk at the property. Each room includes a flat-screen digital TV, tea/coffee services and an en suite bathroom. For your comfort, you will find bathrobes, slippers and free organic Irish toiletries. Some rooms offer landmark views. Interconnecting rooms and rooms with disabled access are available. The Guildhall is 200 m from Shipquay Boutique Hotel, & the Diamond is 100 m away. The Millennium Forum can be reached in 5 minutes' walk. City of Derry Airport is 11 km from the property. This 13th-century castle is located 45 minutes from Galway City. Once the Estate of Lord Ardilaun and the Guinness family, Ashford opened as a luxury hotel in 1939. In 2013 Ashford Castle became part of the Red Carnation Collection, which began a loving restoration project and it now offers 82 bespoke bedrooms and a lakeside cottage. Dining options include formal in the George V, casual in the Dungeon and Cullen’s at the Cottage, or private dining in The Wine Cellars. There is a 32-seat cinema, a library, spa, billiards room, cigar terrace and beautiful public lounges with complimentary high-speed Wi-Fi throughout. 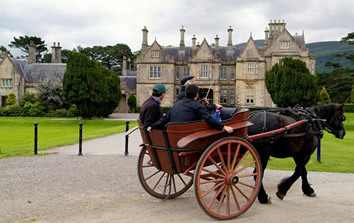 The Ashford Estate offers an extensive range of activities including Orvis fly fishing and Ireland’s first school of falconry. Evocative of an elegant and bygone age, and yet perfectly adapted to the needs of this modern one, Ashford is the oldest castle hotel in Ireland, voted Best of the Best by Virtuoso in 2015 and Best Resort in the U.K. and Ireland by Travel+ Leisure 2016. The Ross Hotel is an exciting new addition to Killarney town perfectly situated in the magnificent south west of Ireland. A seamless fusion of luxury and cool, The Ross provides the services and amenities of a boutique hotel within a stylish and chic environment. Being right in the heart of Killarney town, we are close to nature and the multitude of Killarney tourist activities that you can indulge in, all at your own pace. Trip Advisor has recently named Killarney as the #1 Destination in Ireland, so it's no idle boast when we say that Killarney has it and it’s right on your doorstep. One of the most modern, luxurious and historic hotels in Killarney is home to twenty-nine stunningly stylish and comforting Rooms and Suites. For delicious and fulfilling bites to eat dine in the renowned Cellar One Restaurant and the Lane Cafe Bar, where you can idle the time away sipping the best of Killarney cocktails, chilling to the latest sounds on Spotify and savoring the finest of local produce prepared by our head chef Ian McMonagle. Set on a picturesque bend in the river, just a short walk from Cork city center, The River Lee hotel occupies a unique position in this charming historic city. The River Lee hotel is one of Cork’s leading business and social destinations. All aspects of Cork local life are played out here, from business events and family celebrations, to casual get-togethers in the hotel’s highly popular Weir Rooms including the Weir Room Restaurant, Bar and Terrace on the Weir; a key location in Cork’s growing food scene. Resident guests also have complimentary access to the hotel’s in-house health and fitness club with a 20m swimming pool and spa. The spacious rooms at the River Lee Hotel have floor-to-ceiling windows and are decorated in fresh light colours and modern fabrics. They feature a flat-screen satellite TV, free internet access and bathrooms with a power shower and under-floor heating. The stylish Weir Bistro overlooks the river and has an international menu. The Weir bar offers light snacks, fresh coffees and has an outdoor terrace. To enter Ireland, you need a valid passport with an expiration date of at least 6 months after your return date. 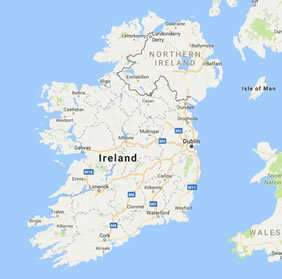 U.S. and Canadian citizens do not need a Visa to enter the Republic of Ireland or Northern Ireland (U.K.). Prices per person in $ USD. A deposit of $850 per person is required to secure a reservation with final payment due by May 6, 2019.